An “interesting” 2018 comes to a close as the MNT takes on Italy in Belgium of all places. The World Cup came and went. It remains to be seen if U.S. Soccer will name a head coach before the end of the year. And, needless to say (but we will anyways) the current crop of youth players will finish the year with a mixed bag of results. As fans there is both a sense of optimism and pessimism as we roll over to 2019. How’s that for a some hype? A bit of solace from this all? 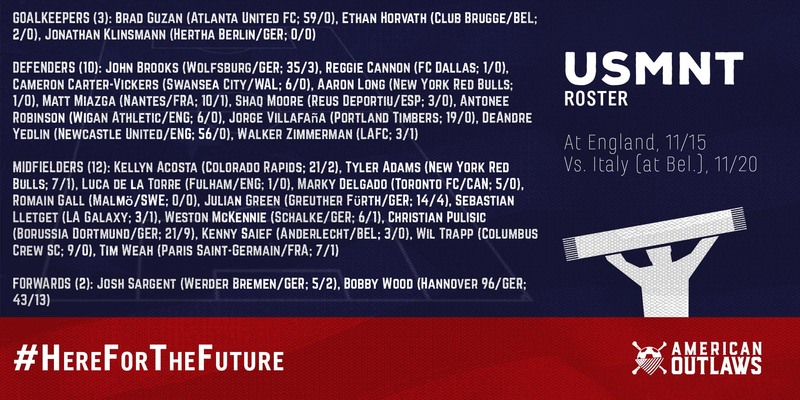 Since we missed out on qualifying last fall the MNT has seen 19 debuts for the senior side (17 of them under the age of 24). * Weston McKennie and Luca de la Torre have departed camp. We called Ethan Horvath as a starter last match, but got Guzan instead so maybe, just maybe, we’ll see our Brugge boy in goal today. Sebastian Lletget returned to the squad for the first time since March of 2017 (lisfrac injury) against England and may get the start tonight. Sargent? Kid deserves a look. Adams? Let’s go. Pulisic? Do the damn thing. Weah? Hell yeah. Let’s dip back into the past though real quick. FORWARDS (6): Domenico Berardi (Sassuolo; 4/0), Federico Chiesa (Fiorentina; 10/0), Moise Kean (Juventus; 0/0), Kevin Lasagna (Udinese; 2/0), Leonardo Pavoletti (Cagliari; 0/0), Matteo Politano (Inter Milan; 1/0). Italy are 2-3-5 in 2018 and unbeaten in their last three matches, most recently drawing European Champs Portugal 0-0 in their last UEFA Nations League group stage on Saturday. Regardless this afternoon you can meet up with your #AOFamily for a beer, see some friendly faces ahead of the holidays, and watch our MNT take on fellow World Cup-missers Italy in the season finale of this sordid saga.